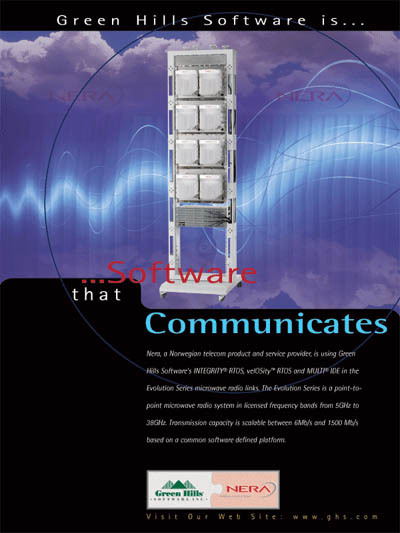 Nera, a Norwegian telecom product and service provider, is using Green Hills Software's INTEGRITY® RTOS, velOSity™ RTOS and MULTI® IDE in the Evolution Series microwave radio links. The Evolution Series is a point-to-point microwave radio system in licensed frequency bands from 5GHz to 38GHz. Transmission capacity is scalable between 6Mb/s and 1500 Mb/s based on a common software defined platform.